That's very astute, actually. I hadn't copped the connection between "Black Cloth" and "BCMP". Maybe it's AAA but they are shoehorning an unnecessary multiplayer mode in, ala TR9 and Deus Ex 3? "Sort of announced Title (?) :-| ? what? (VG) Square Enix/Psyonix"
For the record, that entry has gone from "Nosgoth (VG) Square Enix/Psyonix" to "unAnnounced Title (VG) Square Enix/Psyonix" to this over the space of today. I don't much know what to think other than that some callous cloaked figure must be screaming and shouting at poor Kevin as a result of our premature rubbernecking. Hate that. Not sure if it's relevant, but inspired by the Kevin Reipl listing, I've been trying to find Psyonix employees. Okay a lot of nothing in profiles, but two did catch my eye given Psyonix relatively small status and the 'genre' questions. Essentially at least two Psyonix employees - Thomas Silloway and Ziv Wong have it listed that they are currently working on actual AAA titles - Silloway even notes he is currently working on an "Unannounced AAA Game" (although he also notes contributions to "Unannounced mobile game prototypes") - nothing directly to say they're talking about Nosgoth/WFN - but perhaps a little more promising than it might first have appeared. Interestingly, I went over to Psyonix's official site and noticed that they have the first Gears of War, Bulletstorm, 2 Unreal Tournament games, and Homefront as games they worked on. Does anyone know what they did for those? Basically, SE will "focus on tablets and mobile" due to low sales for their AAA games. They want to rethink the meaning of "AAA". Ugh, I hope this doesn't include LOK. Does Steam deal with Mobile games? I don't know specifics, but they were certainly a support team on those games, and apparently a very worthy and reliable one, given the high standards on those projects. It's only the thought of them acting as lead developers on a LoK game that gives me a big fright. Divine Shadow has discovered the following image in the portfolio of a Psyonix Games artist (no link to it to prevent another poor individual from potentially being censured for accidental leaks). 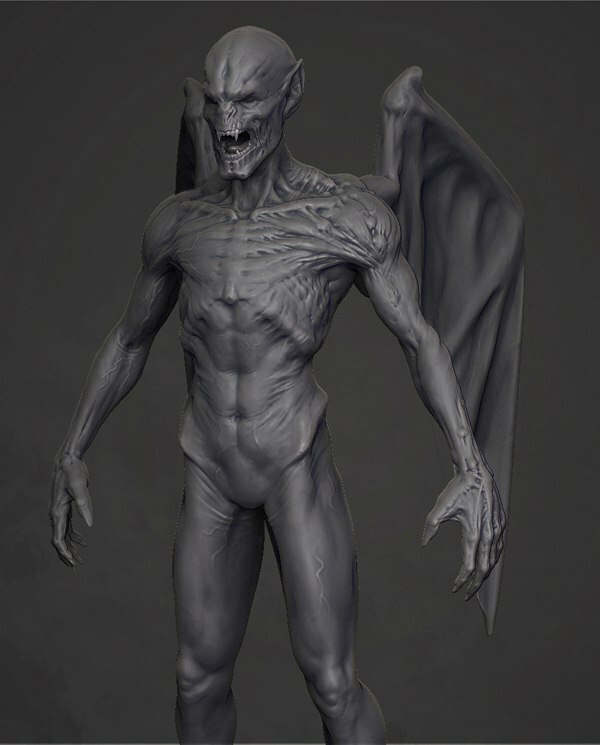 It was labeled "vampire creature concept". Is it possible that Crystal Dynamics isn't involved with this? And If they aren't would we already know that the IP was given to someone else? That's the interesting wrinkle - several Crystal employees are on record as saying they aren't working on LoK. Assuming they're telling the truth then this has to involve other developers. I'm not sure but I don't think they'd really have any reason to tell us of such a change until a game is confirmed. On the artwork, interestingly One of our Facebook followers Alexander Bowe has noted a previous cancelled vampire game by Psyonix which he suggests could account for the concept art, almost amusingly titled "vampire hunter-the dark prophecy". He worked on Aliens Colonial Marines. No hopes left. Usually when these stuffs are correct, official statements don't see the light of Internet world. Don't be silly. Aliens: Colonial Marines wasn't bashed because of its music. If the programmers or designers who worked on ACM worked on Nosgoth, THEN we'd say that there's no hope left. And I don't get why does everyone want CD to have something with it so badly. I mean, Amy is out of the picture, so is Dan, AFAIK, I don't know about Jim, but the rest of them are pretty much interchangeable. So Kevin changed the description like 3 times already? Is he reading this, lol? You know, this is the same situation as with the leaked storyboard artist, so yeah, no doubt itÂ´s a real game, otherwise there would be nothing to hide if it was cancelled. Corlagon: bingo! It must mean Black Cloth MP game, no doubt. I agree, it might be just an additional game mode like in TR. It seems the game is running on Unreal engine for sure, since Psyonix is using it. That makes me think.. if its UE, it wouldnÂ´t be a small game. Count: yeah I agree, there is hardly nobody left in CD from the old team and it seems Square did outsource the game to Psyonix. Or did you mean that by "almost amusingly titled"? I am excited about this as any of you, yet at the same time I am worried, for one thing I always wanted to know the ending to LoK, Defiance ended up a cliffhanger and it has been so many years that a continuation seems unlikely. So this may end up as a reboot or something, like Tomb Raider, which brings me even more worry on how they would approach it, from the characters, to the story, to the art design, and above all voice actors, I am not sure they will bring back Simon Templeman or Michael Bell, and I can't see Kain without Simon, then again since it maybe a reboot I will be more understanding. Yes - that is what I was amused at. At least we know that Psyonix has history with vampire games - albeit brief and cancelled some time ago. Nosgoth revolves around Kain. It's his world through and through and in all the events of the series, he is the central figure. I hope they will have enough common sense to have him in the game. This is a nice little ARM. Anyway, if a new LoK title would come, it should come in the full glory. But I have a feeling that this is some sort of a non-story based game in progress (if it's a game at all). Perhaps it's placed in the LoK lore, but then again anything could be placed in such a huge times-pawn. It says that he's a former owner of Psyonix. No. This stance is wrong on so many levels, it's not even funny. The fact is, if it's a betrayal of our franchise, we must cry foul as loud as possible. Remember: they are interested in selling us something more than we are interested in buying.We have the power because we are paying customers. At our whim will this game be greeted or damned. At our whim. hey everyone has their own likes and opinions here,and remember they're most likely going to be making a type of game that's "in" right now,so that's why i say mmo or something similar to what today's standards are in gaming....as long as they dont change Kain or raziel or their voices or reuse old dialogue..(cough GOL cough) i'd be happy and who knows maybe an ending to the series can be made using a different approach or....(shudders) just a reboot altogether. Well I think it's a surprisingly encouraging, if tenuous, sign on that front to see that they're using the Pillars' magic circle as the project's icon, rather than an image of Raziel's face, or the wraith blade, or something else that's already over and done with in the context of the story. Im thinking its probably not an MMO. We have to consider the fact that LOK isnt a super well known franchise. Its certainly known, but its no D&D or Elder Scrolls or War Craft. While it does have a world as rich as those, I honestly doubt that SE would commit the amount of money it would take to set up an MMO on a franchise that (on recognition at least) can't handle it. Aren't MMOs really expensive to maintain? You need banks of servers to hold the players, tech guys on duty to fix last minute problems, plus constant world building. New content is a must for a successful MMO. SE isn't going to put that kind of time into this....not yet at least. If we are thinking non AAA type game its probably a iOS or Mobile game (hopefully NOT)....but even then I'd bet its a PC/Console release. There is just as much work that goes into a SP game as goes into a MMO. Of course, I could be totally wrong. How many "Non Brand" MMOs have succeeded over the years? Even Brand MMOs fail (Matrix, D&D). Personally I don’t really mind what studio works on a new game (as the main players have departed CD) as long as they have played the series, understood it and try to keep true to it, and not destroy what makes LoK so unique and interesting and has kept us all still discussing it 10 years on…but I’m still hoping they keep with the same genre. Though I can understand if they chose to do an MMO or something (I personally don’t like them but meh) as Nosgoth is a vast world with lots of different races, Hylden, Ancient, Human, Werewolves, Vampires, Demons etc. The Tomb Raider reboot (I might be wrong as I’ve only seen the TV adverts) went back to before the previous games right? Well what if they are planning to do something along those lines with LoK? Well they will want to introduce new players into the back story but still fulfil old fans desire for more than what they already know, either they continue the series in a way to do this with Kain which can be done easily if they intro it properly (and is what I think everyone is hoping for) or they take a different persons point of view, but really who else is there? Just a thought but what about the Hylden vs Ancient war, what led to the Pillars being created, the reaver, the Elder worshippingness, giant battle, the curse, the oohhh, the ahhhh, the prophecy of the Scion…and breath…this would do it. Or they take the creation of Kain’s empire, his discoveries through the Chronoplast which reveal history/the future, the creation of the Lieutenants, the world turning into a wasteland, giving more perspective but it wouldn’t give everything that’s been done before due to the changes made by Kain and Raz to history along the way. Sorry just random thoughts, all this excitement has started the unnecessarily large speculation device in my mind…and now back to reality. Ber - that defiantly looks like the pillar platform, great find! A big thank you to all of you finding and researching this stuff, its awesome detective work! I can’t wait to see more stuff, this is all so exciting!!! !